Can I grow potatoes in a straw bale garden? Home Gardern Care Can I grow potatoes in a straw bale garden? So…everyone loves a spud, and they are surprisingly easy to grow in a bale. When considering what to do with my composted BaleGrow™ bales after 12 – 18 months of production, growing potatoes are always at the top of my list. In fact, I have a designated area just for my spud production! But growing potatoes is not only reserved for old bales. Growing potatoes in bales that are still in good shape is also an option. When planning my planting, I aim to get as much productivity out of my straw bale garden as I can. By conditioning my bales 5-6 months before planting potatoes, this not only leaves me with a nice soft bale to work with but it also gives me a full season’s worth of veggies first. So I condition my bales, plant my first crop, then once that first crop has finished, I’m ready to plant some potatoes. Using a soft bale around 5-6 months after conditioning allows you to place 5 or 6 seed potatoes inside the bale without breaking the strings. This is very important. Keeping the strings around the belly of the bale is holding the composted straw in place. This will nurture the potatoes while growing. Place your hand inside the bale and gently open it up. Take your seed potato and place it inside about two-thirds of the way down. Repeat this with 5 – 6 potatoes across the top of your bale. Once potatoes are in place, give the strings a quick tighten up. To do this, simply take a small stick from your garden and place it inside the string at the end of your bale and twist until the slack is taken up. This will bring in the strings and hold the structure of the bale over the coming months. 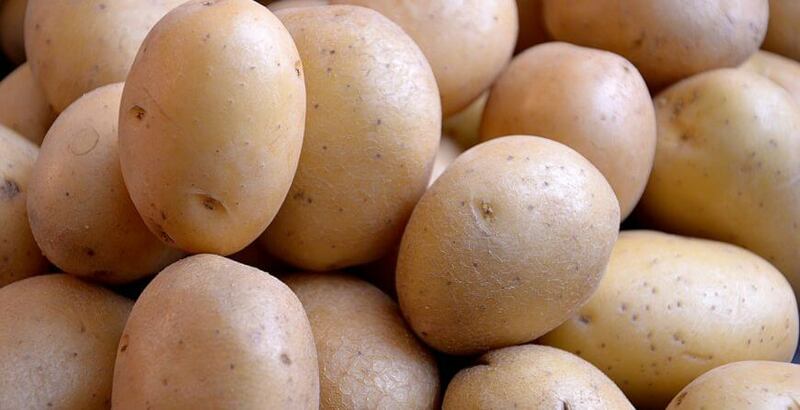 Potatoes can take up to 100 days before they are ready to harvest depending on the variety planted. When you see the leaves beginning to yellow, you can start to harvest your young potatoes. You can either simply reach inside your bale and harvest enough for one meal at a time, or you can cut the strings to open the bale and harvest your whole crop. Waiting until the foliage dies off completely before you harvest will give you late season or mature potatoes. These potatoes store best.